By Year 2 the class were 28 months above their chronological age for reading and 21 months ahead for spelling. The overall achievement range was 7.07 years to 13.09 years for reading and 7.01 years to 14.09 years for spelling. By Year 2 children eligible for Free School Meals were on average 24 months above their chronological age for reading and 20 months above for spelling. By year 2 the boys in the class were on average 36 months above chronological age for reading and 27 months above for spelling. So, given the number of times I have read the assertion that there is no evidence in favour of SSP (systematic synthetic phonics) to teach reading, surely SSP proponents might be expected to be crowing? Their ‘method’ finally has some proof. So where does Dr Marlynne Grant’s study fit into this body of evidence? To appreciate its place you need to be aware of some of the main areas where there has been converging evidence in favour of SSP (systematic synthetic phonics). I will only explain some in more detail but do follow the links. Evidence to disprove the theories behind the method used in the vast majority of British classrooms (see here and here ). This approach is confusingly called ‘mixed methods’. It was theorised in the 1960s and 70s that fluent readers used prediction. Therefore in approximately 94% of British classrooms (see p61) although children are taught to recognise how letters correspond to sounds, when actually reading books children are encouraged to guess what words might be. They are taught to look for ‘cues’ such as knowing the initial letter in the word, overall shape of word, context and pictures. In fact the theories were wrong. Fluent readers don’t guess. However, mostly the reading books used in schools aren’t designed to help children practise to read words left to right through decoding with the letter sound correspondences they are familiar with. The books are designed so guessing works. Many children initially learn this easy shortcut in preference to ‘sounding out’. It is those that gradually lose the guessing habit that will become fluent readers. Too many don’t – as the booming dyslexia industry demonstrates. To be clear an approach to reading based on an entirely debunked theory is still the basis for reading instruction in possibly 94% of British schools. Ignoring all the evidence Reading Recovery, the National Literacy Trust, International Literacy Centre and United Kingdom Literacy Association still advocate ‘mixed methods’. It is this bizarre state of affairs that provoked Stanovich’s whole article above and Stanovich is a good starting point if you are interested in the research in this particular area. 3. Evidence that “the vast majority of school-age struggling readers experience word-level difficulties” (Fletcher et al., 2002; Torgesen, 2002). 4. Some evidence that reading is accomplished with letter-by-letter processing of the word. See here p26. 7. Evidence that decoding should to be taught separately from comprehension. See here and here. Those opposing SSP criticise it for focusing on children’s ability to decode the text rather than comprehend the text’s meaning. These criticisms again ignore the overwhelming evidence regarding decoding and comprehension. a. It seems perverse to criticise a method that nearly eliminates dyslexia type problems (see links in part 7) because it doesn’t also solve children’s comprehension problems. b. There is lots of research showing children will comprehend writing if it is within their spoken vocabulary and understanding. This is known as ‘the Simple View of Reading’. There is little difference in comprehension whether a passage is read to you, or you read it yourself but you can only lift the meaning from the words if you are able to decode them. Therefore to improve comprehension it is essential that children have broad and rich exposure to written literature, much of it at the higher level of children’s oral comprehension, to enrich their vocabulary and knowledge of the world. Critics of SSP suggest it leads to children decoding without attending to the meaning of the words because they are not using ‘prediction’ to read. However, fluent readers don’t guess and it is simply incorrect to suggest SSP leads to poorer comprehension than other methods. In fact comprehension is generally better than average with SSP (see studies in next section) because children read more books so learn more about the world. All children should have exposure to plenty of good literature to improve comprehension then the choice is between a method leading to most children decoding effectively or one where too many struggle to decode and thus comprehension is a real challenge. 8. Evidence that in the classroom SSP leads to results that are startlingly better than is generally expected. Studies that leap to mind are the enormous ‘Project Follow Through’ and the Clackmannanshire longitudinal study but there are many others, see here and here. Dr Grant’s study is interesting because it breaks down the performance of different at-risk groups. Her findings suggest a full study would be fruitful. What does she say led to those results? Simply good SSP from the beginning of Reception (waiting until the phonics screening check in year 1 leaves many behind). Children that struggled were not given ‘other methods to use’ (because they don’t work) they had extra time in catch up groups with the same programme to consolidate their learning. When SSP approaches are taught faithfully, systematically, and without guessing from contextual cues or an emphasis on learning some words by sight, the results can be astounding. Surely things have to change? Can those blinded by ideological bias, misinformation and habit really continue to ignore the weight of evidence and stop others from finding out? Can children be deprived of that most vital skill and precious gift by those unwilling to even look into more successful methods? Thanks to Anna Worthington and others at the Reading Reform Foundation for links and helpful comments. More knowledge = better history? There I was telling my A level students to read as widely as possible so that their judgements were well informed. I would not advise reading more deeply when you have not assimilated and to be honest it wasn’t clear what Chris meant but he didn’t suggest more knowledge was simply a problem if it could not be assimilated, which seems the only interpretation that those that value the discipline of history could find reasonable. He kicked off by asking us if we could all name in order every monarch who was ‘a second’, e.g. Henry II. Presumably he was trying to show the pointlessness of disconnected facts. Perhaps he took his own ability to name them for granted. It is easy to dismiss the value of knowledge when you have it. I, on the other hand, was unable to complete the task and felt ignorant, not smug. Either way this was misleading given that no one in the educational debate over the importance of knowledge places a value on disconnected facts, not even that devil incarnate, Michael Gove (of whom there was the obligatory cartoon caricature on one slide). ‘What is the point of learning large amounts of detailed information when it is there at the touch of a button?’ Chris asked at one point. Again it was unclear how far he was willing to take this argument as he quickly explained that suggesting teaching without knowledge is even an option, is ridiculous. I also don’t know how any teaching could go on without some knowledge being in evidence and wished Chris would, instead of attacking straw men, actually address the arguments of those that think children should be taught MORE knowledge than currently. One of these people, ED Hirsch was mentioned but not his arguments. The talk was disappointing because it simply attacked positions few would hold. He explained that in the past history had often been simply about copying detail off a board that children didn’t understand and I can sympathise with the need to react against that approach. Chris Culpin is very much part of the movement that responded to such poor teaching by stressing skills in history, so his view that more knowledge in schools does not equal better history is unsurprising. The implications of his views were hard to gather from the talk but clearer if you attended the sessions. The idea of spending time telling children a bit about the reigns of preceding monarchs so they grasped the chronology seemed fairly novel in that room. The idea that in history we can be storytellers simply provoked the question that surely that would be very ‘teacher led’ approach (and by implication bad). The idea of doing quizzes to help the kids or any approaches that help ensure KS3 children actually LEARN the events was also unusual. Ironically Michael demonstrated just why it might be useful to know your kings in order as he showed how knowing the story of the previous monarchs, combined with knowing about Shakespeare’s time, meant students could really explain the bard’s interpretation of Richard III. Again, I was embarrassed that I could not order those medieval monarchs without a few minutes to think. Nonetheless when we were all asked to think what explanations the now well informed year 7s might have come up with for Shakespeare’s depiction of Richard III it was that apparently useless knowledge of the kings in order (and whether they were Lancastrian or Yorkist) that I had by now plucked from the recesses of my mind, that came to my rescue and allowed me (and the year 7s) to provide a sensible explanation. Ofsted should become less rigorous and thus more reliable. Michael Gove has suggested Ofsted should inspect private schools as they are more rigorous in their inspection than the private school’s own inspectorate, ISI. My reaction was one of horror. If anything highlights to me what a hollow and harmful process an Ofsted inspection is, it is picturing what they would make of the private school in which I teach. It is my personal view that the majority of private schools would be torn to pieces by Ofsted. In a whole host of ways private schools fall far short of the ‘professionalism’ I encounter in the hours of my daily life I spend communicating with state school teachers on twitter. Certainly, some on twitter seems to relish the prospect of Ofsted getting their claws into private schools. I do wonder what the motive of this group is. Have they been losing sleep over the possible substandard education enjoyed by the 7% of pupils whose parents can afford and choose to pay for a private education? Ofsted still expect well -polished individual lessons. It is my experience that you can teach well with lessons that are generally just ‘satisfactory’. (You might have read about my ‘really bad’ teaching.) Teachers are not first and foremost entertainers and they don’t have time to keep producing well-crafted lessons. Teaching a class is a marathon , not a sprint. Do we criticise the marathon runner because at the moment we observe him he is not running flat out? An experienced teacher knows when they need to really polish up the performance and when ticking along is good enough. For me THAT is what being a professional is about. It is about being allowed to use your wisdom to determine your priorities, NOT about being seen to fulfil the priorities on someone else’s (Ofsted’s) check list. Under an ISI inspection, the hoops I must jump through are fewer and so my school feels much less compulsion to prescribe how I should teach. I am allowed to be a professional (rather than demonstrate apparent professionalism through paperwork). I am horrified at the thought of an Ofsted inspection because much of what makes teaching good at my school is barely valued by Ofsted and I would have to waste precious time jumping through absurd hoops to appease the inspectors. Unless your lesson is being observed by a real subject expert, with a proven track record of success they are unlikely to spot the myriad of ways your apparently bog standard lesson is doing a good job. Ofsted reports rarely praise careful long term planning that ensures each apparently bog standard lesson provides the next brick in the carefully planned structure I am building. They probably wouldn’t even be thrilled by the testing regime I’ve introduced that has helped kids remember the material. The fact that students are expected to work hard and given plenty of practice with written work won’t save me if a checklist suggests my individual lessons are ‘uninspiring’. Ofsted expect proof children are making ‘progress’. In my school we don’t set formal targets, the tracking is very light touch and mainly used to ensure kids are working hard. ISI expect schools to keep tabs on progress but the whole data game in which you must demonstrate progress year on year or even term by term is missing AND RIGHTLY SO. Except in subjects that are very hierarchical in their subject matter, such as maths, the whole process of demonstrating progress against objective levels is an almighty sham. School inspection is like marking an essay. You can grade against the criteria you have decided and put systems in place to moderate that process and declare your marking reliable. However, your very criteria can be suspect. In fact the more prescriptive you are in your criteria, the more impoverished your model of what a good essay (or a good school) looks like. Ofsted inspections are like the most prescriptive mark schemes I am forced to train my students to understand. My A grade AS history students would get a C or D on their OCR document paper if they weren’t rigorously drilled – and good schools would be ripped apart if they did not prepare for Ofsted. To highlight this, imagine that Ofsted started to inspect schools abroad. Are all those schools requiring improvement? Yet few would pass an Ofsted inspection without a thorough familiarity with Ofsted expectations. Would that familiarity then make them a better school? Well, some of the schools must have been good already, so most of their busy-ness would be simply to appease inspectors. I don’t think I am lazy and I’m sure the teachers at my school work very hard. I’m not scared of getting ‘found out’ if Ofsted inspected private schools. I’m scared of losing all the freedom that makes my job satisfying. It is that loss of freedom that puts me off working in the state sector. I am in favour of accountability. However, I am against pretend accountability. There is no point saying something is a necessity if it doesn’t work. Ideally I’d like a system in which I am inspected by highly experienced subject specialists with a proven track record of success that looked at the students’ work in detail and spent time talking to the HoD and department teachers. They are more likely to recognise good learning, whatever their prejudice about classroom teaching methods. Failing that, don’t pretend you can judge. School inspection should accept the proven limits of its capability to judge the quality of lessons. (as demonstrated by Professor Coe here.) Exam results, for all their flaws, are the only really objective measure of a school’s success but should be used intelligently. Private schools live or die by their exam results but I am free to use my judgement of how to achieve those results. ISI inspections seem to have less fixed expectations of what they expect to see fulfilled and so, seem to find less to criticise. In this sense I’d agree that Gove is right to say they are less rigorous. However, in a situation where success criteria are so subjective, less ‘rigour’ is a very good thing. ISI inspections need to spot big problems but to me do seem more the ‘hygiene inspector than the food critic’. School inspections are necessary but prescriptive expectations seem to lead to bad judgements rather than spot real weaknesses in schools primed to jump through the Ofsted hoops. Therefore inspections need to become LESS rigorous and thus, within the limits of what they can safely judge, more reliable. Confessions of a tiger mother. Why I teach my children, part 2. These views are commonly heard from parents who just want to accept their child for what they are, to love their child whatever their strengths or weaknesses and not put unnecessary stress on that child. To set out to ‘improve’ your child seems to suggest you think they are inadequate as they are. There is virtue, it seems, in allowing a child to progress ‘naturally’ without artificial extra input. The motives of these parents are good but they are wrong. I was wrong. When my eldest was born I often joked about the shape of her baby head and suggested to my husband that the fact it jutted out unusually far at the back was because of the extra ‘maths pack’ inherited from her father to supplement the meagre maths ability she inherited from me. However, unsurprisingly really, her head shape didn’t help her. Her friends all learnt to count to ten way before her and her reception teacher told us she seemed noticeably stronger at literacy. By the end of year one she was a 1C and disliked numeracy. That is not terribly ‘behind’ but I had to face the likelihood that if I sent her to the prep school attached to my own senior school, (starting at age 7) I would have to pay for extra maths because she probably wouldn’t meet the required entry standard in maths. What! send my precious child to a school where she would begin ‘behind’? No way! Perhaps I should have ‘accepted her as she was’, weaker at maths maybe, but nonetheless my wonderful child, not to be labeled by a dehumanising selection process. I chose to teach her extra maths at home. Funnily enough I was still pretty much signed up to nature over nurture but my foray into phonics around this time meant I encountered the work of Zig Engelmann. 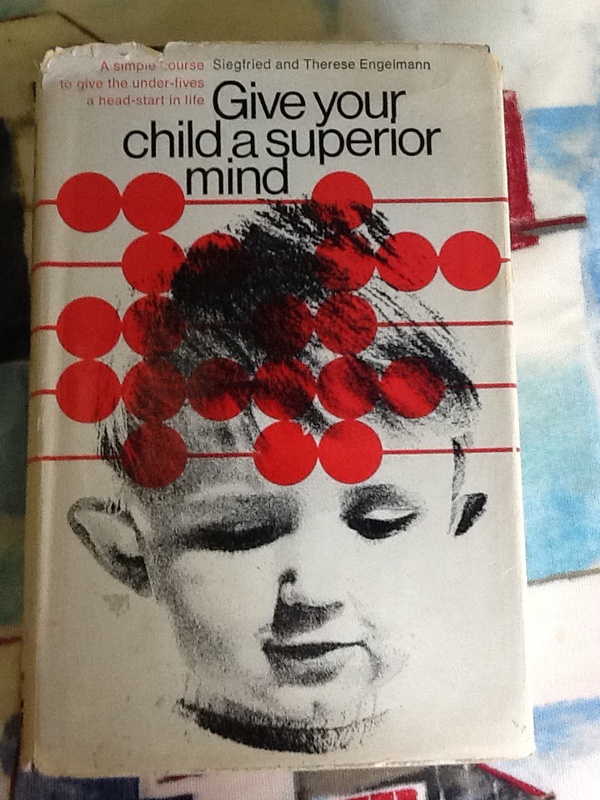 Particularly a book written in 1966 with the spectacularly Un-PC title ‘Give your child a superior mind’. Engelmann argues that through systematic teaching you can enormously improve the academic ability and future potential of your pre-schooler. In fairness to him, his whole life’s work has been focused on improving the life chances of the most deprived children but this book shared the approach he had taken with his own children. I implemented some of his ideas. My daughter’s maths gradually improved. I remember the moment when I suggested to my husband she might get a level 3 at the end of year 2. He laughed but she did, and sailed through the entrance exam. She has been near the top of the top set ever since and is keen to do her GCSE at the end of year 8. I saw what it took to make that happen. I was there every step of the way and it I know it wasn’t ‘ability’, it was hard (but well chosen) work. My second daughter has made even better progress in maths. Maths really is relentlessly hierarchical. Engelmann’s Direct Instruction suggests a mastery approach, fluency in the basics and gradually building on that. It works. There is no ‘natural ability level’ in maths. True, my second daughter seems to have a better memory than my eldest and learnt faster but whatever limits nature places on our potential virtually all of us could have reached a high standard in maths. Funnily enough we all actually know that there is no natural level of ability. When we anxiously try to ensure our children become readers, the more books the better, what are we attempting, if not to ‘give our child a superior mind’? When we talk about the advantages of middle class children I don’t think we are talking about genetic advantages. It is well known that statistically speaking the eldest sibling does better academically. We all know how much better some countries are at maths and I know exactly why. I think what startled me as I worked with my own children was just HOW unfixed a child’s academic potential is. If a parent says to me that they are happy to allow their child to make as much progress as their regular schooling permits I fully respect that choice. However, that degree of progress is no reflection of an ‘innate’ ability level. It might seem loving and accepting to leave children to develop ‘natural talents’ but it is an inconvenient truth that progress is dependent on input. Why on earth did I think that a lack of mathematical talent stopped my eldest from learning to count to ten? All we had to do was count with her more frequently. 2. I teach my children because l want to share the beauty of knowledge with them. I just cannot understand those parents who want to keep their children like the noble savage, as if there is beauty in ignorance. I do think some knowledge is wholly inappropriate for children but I find the idea that academic knowledge is corrupting absurd (see previous post). I taught my youngest child to read before school because I knew how to and it was wonderful to open up the written world to him. Do you avoid pointing out the cars, trees and other features of the world around your toddler until they are older because ‘they don’t need that knowledge yet’? 3. I teach my children because it is my gift to them. I have been known to teach the odd rather crumby lesson – I admit it. However, as humble as I am, I know that I can teach, and teach well when I can really put my mind to it. If I had other skills I might perhaps have other priorities. There are endless things that are more important than being clever, being a kind and decent human being or fulfilled in life are high up there for a start. However, while I can only try to bring my children up in the way they should go, I know I can help them academically. Teaching my own children has also been a privilege and (in retrospect at least) a real joy. If you are a secondary teacher you will know that odd feeling of disbelief when your first exam classes get their results. ‘Wow, it is because I taught them that they got those results.’ I am thrilled that I, as their mother, worked with my children as they learnt to read. I was there as they took their metaphorical first steps. I rather sentimentally hope that perhaps it was a privilege for my children that they were taught with a mother’s love. 4. Teaching my children has given me a deeper understanding of how all children learn. This has been a surprising byproduct. For example, teaching young children maths has really opened up to me the way understanding is never all or nothing. I am no longer surprised when my own classes can’t do the thing they could yesterday. Perhaps more of this in another blog post. In conclusion. My kids will be cleverer for the extra teaching they have received but it seems likely that they would do well enough at school without any extra input. They would have good enough qualifications to earn a living and play their part in society. Therefore, although these two blogs might be about why I teach my own children the really important implications are for those children who are at risk of getting no qualifications, and ending up without decent literacy and numeracy skills. This is an unnecessary tragedy. It is wrong to assume children have reached a natural level of potential through one’s teaching. There can be enormous challenges and all sorts of limits on what you can achieve within the time and with the resources available but primary education in our country is imbued with developmentalist assumptions (see here and here) that stop teachers even setting out to teach basic numeracy and literacy. ‘Breaking the prairie sod’ (see my last post) is unthinkable because children must be ‘ready’ and learning MUST BE FUN! Teaching numeracy and literacy systematically and providing enough practice go against child centred orthodoxies. My own experience would suggest that these orthodoxies are incorrect and harmful. The previous post explains why I reject common argumnts against teaching young children academic content.